When an infamous New England winter comes rolling (or crashing) in, it’s time to search for beauty in unexpected places, like your backyard. Whether you love winter or it’s your fourth favorite season, there is splendor to be enjoyed wherever you look, just as long as you are looking for it. Here are some simple winter landscape ideas to help you appreciate your New England home in all its glory. Some ideas may require that you begin planning in the fall, but some you will be able to implement at any time, even in the middle of a snowstorm. 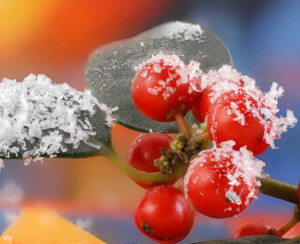 Bring more beauty into your backyard with winter landscaping plants. This is a project best planned in the fall to ensure you have lots of eye-appeal in the winter. Incorporate bushes with berries – like winterberry – for bursts of color amid bleak surroundings. Here is a helpful list of cold-weather plants that will enhance New England’s winter palette. Cold-weather plants can either go in the ground or in a cheerful pot, watering can, barrel or other container. Incorporate winter-growing annuals like pansies, calendula, and violas. Tuck curly willow branches, winterberry stems, and miniature evergreens into any weather-safe container for instant appeal. Collect inspiration on Pinterest. Check the birdfeeders often and replenish birdbaths with warm water. Try these homemade birdseed feeders. For bird lovers, there’s much joy found in sighting a bright red cardinal sitting on a snowy tree branch, or waking to the songs of birds at play. Incorporating native plants (as mentioned above) will naturally attract birds for they provide food and shelter. Leave dormant plants – such as ornamental grasses, coneflower, and black-eyed Susan – to stand over the winter; birds enjoy scratching for seeds all winter long. Get creative with colorful DIY garden decorations. Make ice balls – all that’s required is water, a few drops of food coloring, and balloons. Place these whimsical marbles in a wheel barrel, bucket, among plants or along your walkway. Design a twig wreath to be hung on a fence, wall, shed or seating area. Have fun with this inexpensive yard art that transforms hubcaps into cheerful flowers. For a garden as attractive in the snow as it is in the summertime, learn about Greener Horizon’s seasonal displays. Our experts offer quality landscape design, stone work, plant installations and irrigation systems for New England dwellers. Read more helpful articles on our blog or contact us with any questions or to request a free consultation.